By Cath Genovia, ASP Program Assistant. 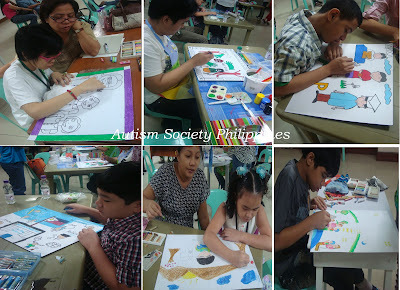 A long week-end and a cool weather were no match to the passion of the talented students with autism to join the on-the-spot painting contest last Jan 23 at Department of Environment and Natural Resources (DENR) central office in Quezon City. 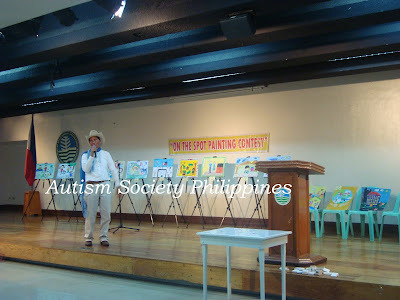 This year’s contest theme “Making the Rights Real for Filipinos with Autism” were exhibited by the contestant through their artworks. The said painting contest has been a major activity of ASP’s NACW celebration for the past five years. The activity serves as a venue to identify and develop children’s with autism (CWA) artistic potentials. The contest has three categories: (1) self-contained and (2) mainstreamed elementary and (3) mainstreamed high school. The contest proper was hosted by Mr. Prime Bonife of DENR. The panel of judges was composed of a SpEd teacher, a church worker, a public employee and two arts teachers. All participants were so happy to receive a gold medal courtesy of Governor Vilma Santos-Recto of Batangas, a certificate of participation and a token from the Social Services Committee of the House of Representatives. To have an element of surprise, winners per category will be announced during the closing program of ASP’s 16th NACW in SM Fairview, Quezon City. Thanks to the Department of Environment and Natural Resources (DENR), Committee on Social Services, House of Representatives, Department of Education (DepEd), Department of Interior and Local Government (DILG), National Council on Disability Affairs (NCDA) and ASP National Office for sponsoring this activity.